So, many of us over the years have shopped with RockAuto.com. They are known for having awesome prices on car parts, along with fast shipping and a regular supply of coupon codes, all in the name of keeping our cars road worthy. So for any RockAuto.com regulars, you also know they send a magnet featuring a person's car with the RockAuto.com slogan and logo. So, I am asking members to share a pic of where you keep your magnets, how many are in the pic and if you have a favorite. If you wish to get creative with your pic, even more fun!! Last edited by The_Maniac; 12-04-2014 at 11:20 PM. I'll go first. 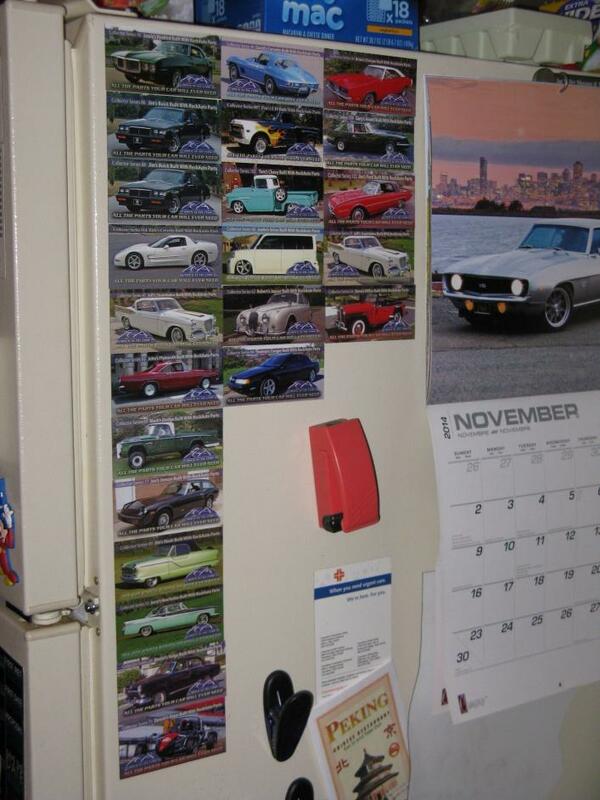 Not all, but a greater magority of my RockAuto magnets end up on the side of my refrigerator in my kitchen. In this pic (including duplicates) is a total of 23 magnets. Of this selection, the Grand National is my favorite. But, I do have other magnets on my tool box in the garage and a filing cabinet in my home office (and I'm sure a couple got tossed in the trash of the years by accident). I hope that a member see's your post & might be able to help or trade etc. I only have one lol, hopefully someone catches jasons car. Rockauto told me my car was in a group of pics being considered for magnets and they would be in touch of it was going to make it to the magnets. To see the full magnet just click the image of the one you want to expand. Anyone here get their car on a magnet?